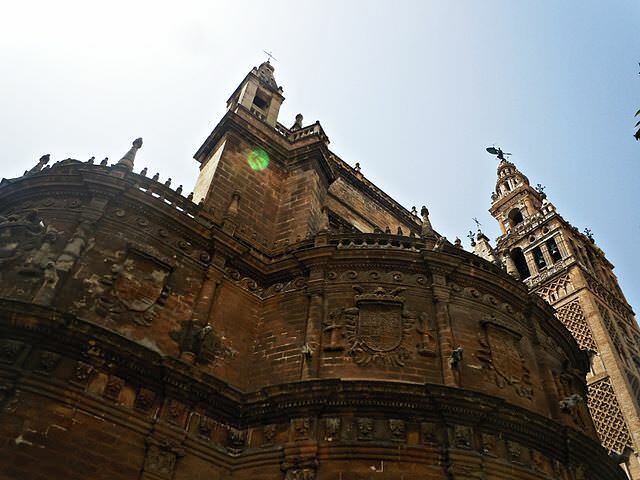 The city’s symbol is the Cathedral of Seville. This cathedral was built on the ruins of a mosque. The mosque’s minaret, renown for its architecture, was not demolished and was later transformed into a bell tower. Visitors will be able to tour the cathedral, which has several naves with vaulted ceilings. The main altarpiece, the Retablo Mayor, is a large golden altarpiece decorated with carved sculptures that is located next to the main chapel. After touring the cathedral’s many naves and halls, some of which are galleries with collections of embroidered cloths and golden cups. The Alcazar of Seville is located on one side of the Cathedral. This building used to be a Moorish fortress and was later transformed into a Royal Palace used by several generations of Kings. Each generation has added more halls, and now the Alcazar is an historical piece in itself. After exploring the many halls and ancient baths and pools visitors can spend an afternoon walking around the gardens of the fortress. This neighbourhood is the area where the Alcazar and Cathedral are located. Part of this neighbourhood was part of the city’s Jewish Quarter. Nowadays this area has been transformed into a place filled with lounges, restaurants and traditional shops. 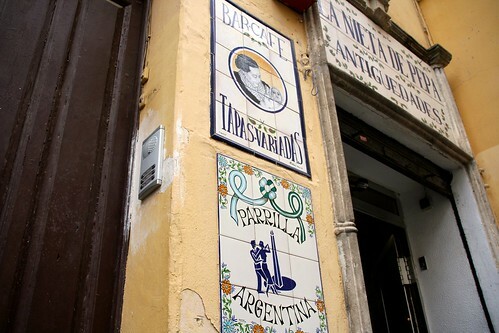 Some of the city’s most famous tapas bars are located around the many squares of the neighbourhood. This is part of what makes Seville an ideal destination for an affordable city break: tapas are cheap and filling, and the city is filled with ancient landmarks. Typical tapas range from salmorejo soup to sliced jamón ibérico ham, including a range of revueltos made using scrambled eggs and ham and fried fish served with ali oli sauce. Located on one side of the Guadalquivir river, the neighbourhood can be reached by crossing one of the city’s many bridges. This traditional neighbourhood has narrow streets and several ancient churches. A castle which was used during the Inquisition is located in this area. Near the Isabel II bridge, which is known for its sculptures, visitors will find some of the area’s most tasty tapas, which are served in the many terraces that have views towards the Guadalquivir river. After having dinner visitors can visit an authentic flamenco bar. The park is located south of the city center, on the banks of the river. The park used to be part of the grounds of the San Telmo Palace and many of the buildings around the main square were built for an expo. The main square is the Plaza de España square. The semicircular square has many niches, with each niche representing one of Spain’s provinces. Each niche is decorated with ceramic tiled and benches, and the tiled murals show the province’s typical landmarks and products. Visitors can explore this park in a carriage drawn by horses and by renting a rowing boat. Have you ever been to Seville? What were your favourite sites? Please share below! One of my favourite activities when in Spain is to just stroll the streets and immortalize the views, many of which are unnoticed by the crowds. We love doing that as well – in every city! I arrived in Seville last night and can’t wait to continue to explore the city, and take in the culture!